On average just over half of people (53%) living in Wales are taking advantage of a free bowel screening test that has the potential to save lives. 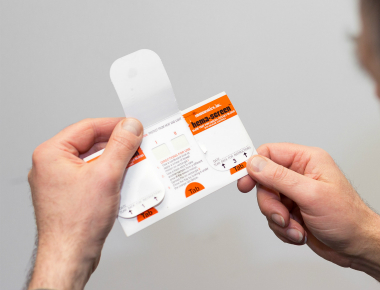 Together with Bowel Screening Wales we are encouraging more people living in the country to complete the test when they receive it in the post, as this month marks the tenth anniversary of bowel screening in Wales. Bowel screening can detect bowel cancer at an early stage in people with no symptoms when it is easier to treat and there is a greater chance of survival. Uptake rates for bowel cancer screening are low with little variation across Wales. Ideally we want to see everyone take up their screening offer. The bottom three areas that need to see the most improvement are: Merthyr Tydfil (49%), Cardiff (49%) and Wrexham (50%). The top three areas with the highest uptake are: Anglesey (55%), Powys (55%) and Caerphilly (54%). More than 2,200 people are diagnosed with bowel cancer each year in Wales and over 900 people die from the disease. It’s the second biggest cancer killer in the country. However it shouldn’t be because it is treatable and curable especially if diagnosed early. Lowri Griffiths, Head of Wales for Bowel Cancer UK, says: “It’s quite simple, bowel screening saves lives. I would encourage everyone who’s over 60 to take the test, and for those who are younger to encourage their loved ones to complete it. Don’t delay or put the test off - it could save yours or your loved ones life.